I have tried cooking a few kind of claypot chicken recipes and each one of it has it's own taste and speciality. 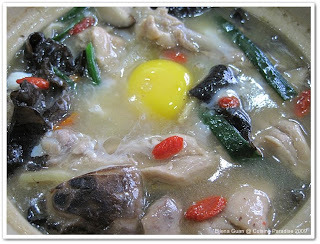 Today this Claypot Drunken Chicken that I am going to share consists of Chicken pieces, mushroom, black fungs, wine and Egg. This can be serve as a one-pot dish meal which is full of nutritious source. We love the thick and creamy gravy which is great to be serve with steam rice. Since this is called Drunken Chicken, it is bound to have some wine content. So if you are to share this dish with younger kid at home, you can either omit the wine content or reduce the amount used. 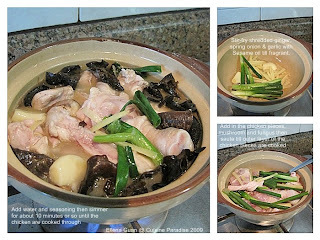 This recipe call for Kampong Chicken which the meat is much sweeter and cooked resistance for stewing purposes. 1. Wash and clean the chicken then cut into pieces then set aside for use. 2. Preheat the sesame oil in the claypot then saute the shredded ginger till fragrant then add in the chicken pieces and half of the spring onion sections then continue to fry for another 1 minutes. 3. Next stir in the oyster sauce to the chicken mixture till combined then add in the mushroom and black fungus. 4. Give them a quick stir then pour in the water and let the mixture simmer for about 15 - 20 minutes until chicken is well cooked. 5. Lastly, add in the rice wine and balance of the spring onion and wolfberries and bring it to boil then stir in the cornstarch solution to thick the sauce. 6. Remove the pot from heat and crack the egg in the middle, cover for 1 minute then serve with steam white rice. a) You can replace the Kampong Chicken with 2 Large Drumstick with tight portion. b) You can replace rice wine with Japanese Mirin or Sake but reduce the amount to 60ml. c) You can add 1 tablespoon spoon water to 1/2 teaspoon of cornflour to make the cornstarch solution. I have heard about this Durian Fried Rice from one of the Hong Kong style cafe called "Central" where they have a few branches in Singapore, one of it located at the basement of Takashimaya. 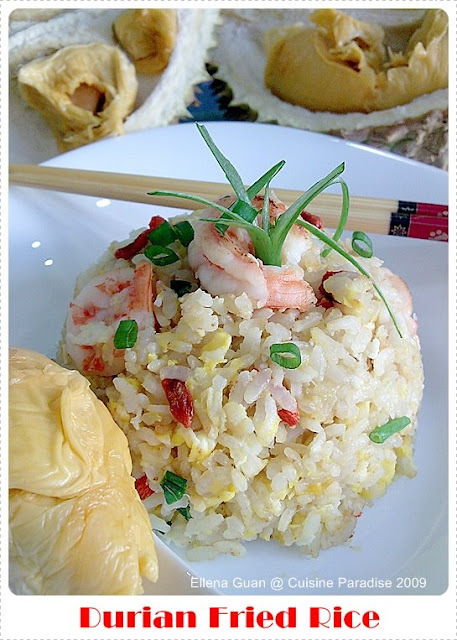 I guess not many of us will dare to take the risk on trying this dish on the combination of seafood fried rice with Durian. But to me, this is always an interesting dish to try on since from young I always love the combination of white rice serve with durian flesh. As now is the Durian peak seasoning, I decided to grab a few from the fruit stall to test out some interesting recipe which I have keep in view for a long time. So based on the food review from some of the blogger who have tried this dish, I came out with my own version of Durian Fried Rice. 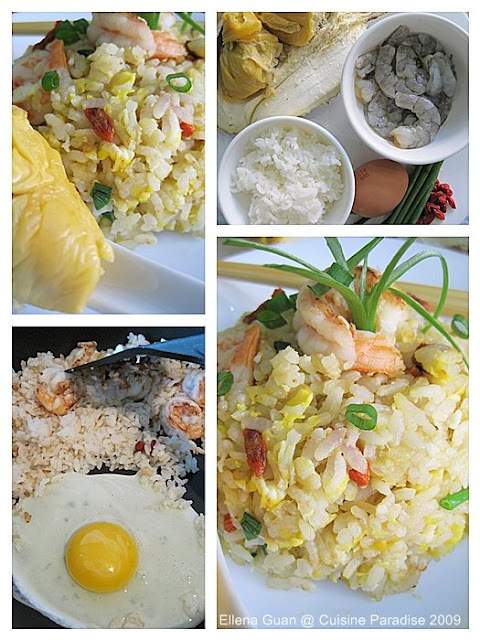 Since I always fancy the idea of mixing rice with durian, I found this combination of fried rice is very special and the taste do blend in well with the fried, rice and egg. I didn't add any seasoning to this dish, and not even to the prawn as well. 1. Pre-heat a frying pan with oil and saute the chopped garlic until fragrant then stir in the prawn and fry until cooked through. 2. Next stir in the cooked rice and give it a quick stir to separate each of the grain from sticking together. 3. Push the rice mixture to aside(refer to the picture above) then crack an egg into the pan and stir-it through to the rice mixture until combine then add in the wolfberries. 4. Lastly, push the rice mixture aside again and add in the Durian flesh and give it a quick stir to loosen the paste then stir it into the rice mixture till well combined. 5. Remove the pan from heat, and sprinkle chopped spring onion into rice mixture, dish up and serve warm with extra seeds of durian. a) If you want it to be a bit savoury, you can add 1/4 teaspoon of salt or seasoning to stir-fry the fried before adding the durian. 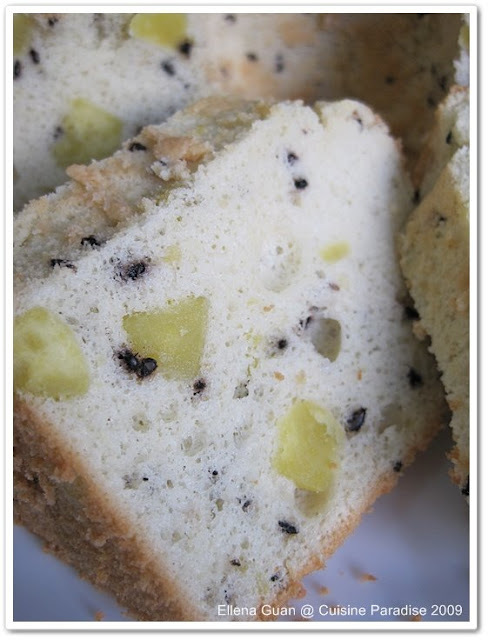 This is 2nd Chiffon Cake recipe that I experiment and tested. 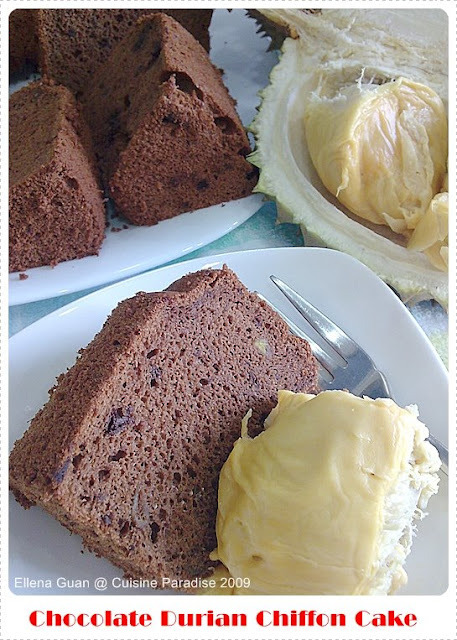 I used the combination of Cocoa Powder + 70% Dark Chocolate + fresh DURIAN as main ingredients. So you can imagine having a bite on this slice of cake with such combination where you can actually smell and taste the baked durian in a rich cocoa content. Since this is a chiffon cake, you will find the texture of the cake to be light, spongy and fluffy rather than that greasy and dense compare to cake. Recently while blog hopping around, I saw a few of my favour food blogs will into chiffon cake making. So I thought maybe I would also like to join in the fun of chiffon cake making. After much selection I decided to settle on this Sweet Potato & Sesame Chiffon Cake rather than our usual local Pandan Chiffon Cake. This is a busy weekend for me as I suddenly have the urge to conquer a few recipes in my to-do-list. While waiting for my son to finish his Saturday enrichment class, I managed to stomp upon this Organic Wholemeal Flour from one of the local supermarket. 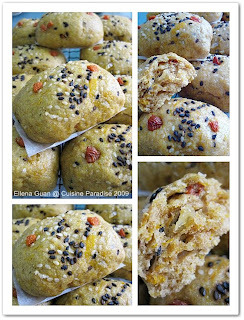 It has a finer and right texture compare to another brand that I used to buy so I decided to get a packet to test out my new Steam Pumpkin Mantou recipe which I modify from the previous recipe that I made. I modify the recipe a bit which made this rather simple and easy compare to previous one. And this Steam Mantou is full of texture when biting because of the use of the Wholemeal flour, Sesame seeds, Raisin and Wolfberries. 2. When the cubes became soft, mashed them using a fork and set side to cool to lukewarm temperature before adding to the flour to form a dough. 3. Sift the flour, baking powder and yeast together then add in the sugar and stir till combine. 4. Next slowly add in the mashed pumpkin and stir using a pair of chopstick till combine, you might need to add some water in order to form a dough. 5. 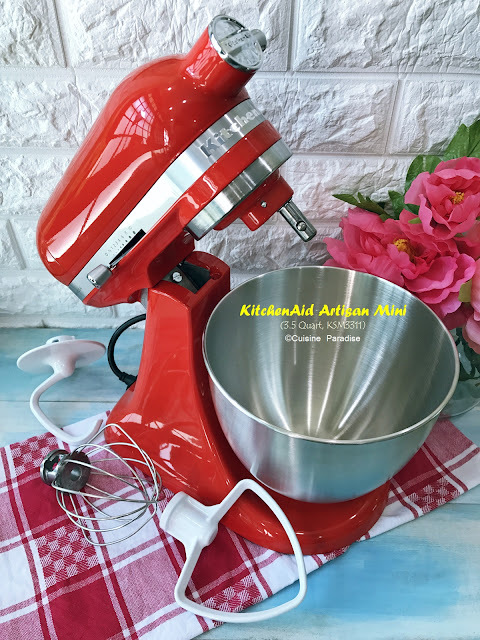 Moist your hand with some oil and give the dough a few knead to combine it then set it aside in a lightly flour/oil bowl to proof for about 20 - 30 minutes until double it size. 6. 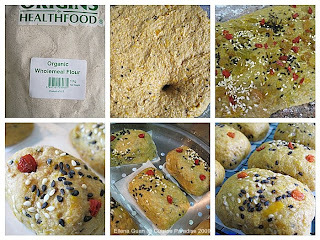 Divide the dough into 2 or 3 portions then on a lightly floured work surface, flatten each portion into a rectangular shape shown like that picture shown above, sprinkle some chopped wolfberries, golden raisin and sesame seeds then roll it up lengthwise into an oblong shape then cut them into equal portion. 7. Place each shaped portion on a piece of greaseproof paper, top with some extra wolfberries and sesame seeds then arrange on the steamer rack and steam over medium heat for about 8 - 10 minutes depend on the size. a) You might need to cook the pumpkin for about 3 - 5 minutes more before it will be soften depend on the power of your microwave. 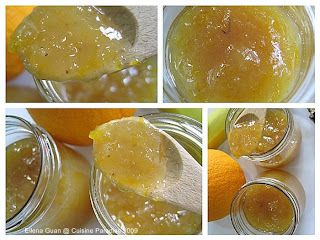 b) You can also replace the brown sugar with caster sugar instead. c) This is best to serve within the same day, if not you can keep in the freezer for a few weeks, and reheat it before serving. 2. Cut the orange into half, juice half of it to get about 50ml of juice then cut off the outer peel of the other half of the orange, remove the pith and membrane. 3. For each section, cut between the fruit and membrane on each side. 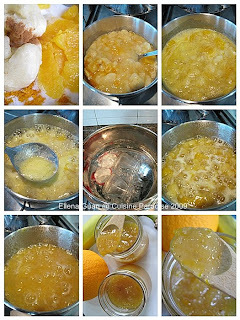 Lift out each segment and drop it into the saucepan together with the sugar. 4. Next weight and mash the banana with a fork then add it into the saucepan together with the orange juice and cinnamon powder. 5. Stir all the mixture over medium low heat for about 10 - 15 minutes. 7. Pour the cooked jam into the sterilize glass bottle, covered and let it cool to room temperature before storing it in the fridge. I am so excited to share with you that with your nomination, my blog "Cuisine Paradise" has been shortlisted as one of the 10 Finalist for the category under Singapore Blog Awards - Best Food Blog.Voting is open to public from 15 June 2009 till 31 July 2009. You can vote only ONCE a day. So if you like my blogs and recipes please help to cast your valuable vote for me, ok :) But in order for me to receive your vote, you need to register an account as a member with the blog award organiser (OMY.sg). If it is not troublesome for you to help, you can find the online registration form here (click here to register). Upon successful registration as a memeber, please click on the above VOTE ME icons and you will be directed to the Voting Page where you can see the Top 3 Leading Finalists of each categories. 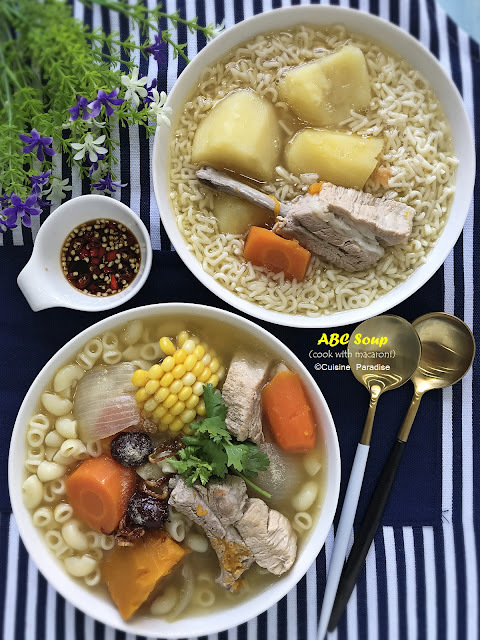 Next click on this green Voting link on the right side of your screen and click on the Best Food Blog(最佳饮食部落格) category shown below to cast your vote. You will see a RED label VOTE on the top right corner of my avatar To cast your vote, you need to click on the word VOTE instead of the picture which will be direct you back into my foodblog URL. You will see this confirmation box for you to verified your voting. Click on the word "Confirm" and upon successful voting,you will see a Yellow label showing VOTED on the avatar. Thank you everyone for your all support! Because of each of your valuable vote and time, Cuisine Paradise is able to be listed in the top 10 finalists.